Olathe West sophomore Bailey Collar’s mother, Cassie, was a standout high school gymnast and a member on the University of Kansas national champion cheer team in 1995. Collar’s father, Tim, played high school basketball and served as NAIA Avila University’s quarterback. Bailey’s younger brother, Brady, is 12 and has shown strong talent in multiple sports, including gymnastics, cross country and basketball. Brady is a Level 5 gymnast and has traveled to out-of-state meets, including St. Louis. Collar’s passion and talent helped her start for the Owls in their inaugural game in the 2017-18 season. Last year, Olathe West finished 6-14 in its first year as a school. Collar earned third team all-Sunflower League honors. The top-three all-conference teams had 20 total players, and Collar was the only freshman girl named. She averaged 14.5 points per contest and set a school mark with 25 points in a contest twice. “As a freshman, that was pretty special, and I realized that if I keep working, the sky is the limit,” Collar said of the recognition. A year later, Collar is one of the state’s top sophomores for an improved Olathe West team. The Owls are 6-8 and have captured four straight. OW went 2-1 at the challenging Lawrence Free State tournament, including a 74-58 victory against Shawnee Mission North. OW delivers 55 points a game. In the 16-team Class 6A West, only Blue Valley North, at 59 points a game, averages more points a contest, according to KSHSAA statistics. “It was really cool to be able to start the traditions and be a part of the first-year school, and set the tone and chemistry of the team,” she said. One of three team captains, the 5-foot-8 Collar averages 16 points a contest and has received interest from UMKC and KU, among others. 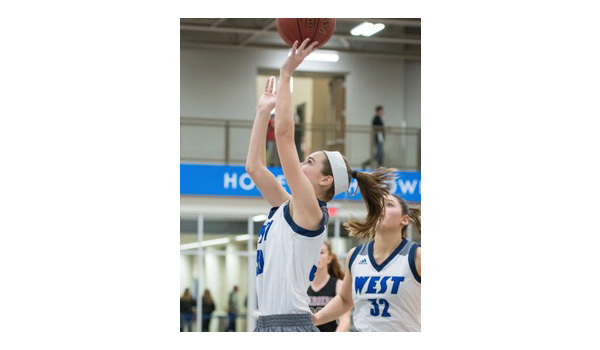 On Jan. 8 versus Shawnee Mission West, she set a school mark with seven 3s in one contest. She ranks fourth in the conference in scoring, according to Sunflower Smack, a media entity that closely follows SFL girls’ basketball. Collar broke her school mark with 30 points against Topeka West on Jan. 25. Statewide, she is part of a highly talented group of sophomore girls that includes Bishop Miege’s Payton Verhulst and Faith Hawthorne, Cheney’s Kylee Scheer, Spearville’s Alissa Heskamp, Pittsburg’s Madden Petty, WaKeeney-Trego Community’s Lili Shubert and Beloit/St. John’s-Tipton’s Lauryn Dubbert. Among sophomores, only McLouth’s Amy Mitchell and Scheer average more than Collar, according to MaxPreps statewide lists. Collar has played on Kansas Elite, a squad that includes Olathe South junior Dani Winslow. In the summer, Elite went to showcase tournaments in Indianapolis, Chicago, Minneapolis and Ames, Iowa. Additionally, Collar has helped spark early success for OW girls’ sports. In the fall, Olathe West football made a surprise run to the Class 5A semifinals in its first season as a varsity sport. Coach Kristine Williams is in her second season with Olathe West. Williams has coached Collar in camps since she was in second grade. Williams was the middle school coach at Chisolm Trail, where Collar attended. Williams, who is active on Twitter with @OlatheWestGBB, has helped form team chemistry in several ways. While multiple football players came from the Olathe North school district, Collar was part of Olathe South. Before her freshman year, Collar didn’t know her high school basketball teammates very well. They bonded through camps, practices, school and service. The last two summers, Olathe West has attended a Pittsburg State team camp and stayed in the dorms, which has helped the program to bond. OW often does community service, especially the big Special Olympics clinic in December that both Hawk boys’ and girls’ basketball teams help lead. The Uhde sisters – lone senior Ayiana and junior Anaiya – were each honorable mention all-conference last winter. Junior Ashley Gibson is known for her defense and has earned team recognition as an Owl Complete Defender and Black Shirt Defender. Collar has also collected Owl Complete Defender honors, and sophomore Sydney Loveless was a Black Shirt Defender award winner. Sophomore Michelle Anderson has also earned Black Shirt Defender honors after a big performance at the Free State tournament. She had 41 points, nine rebounds and six steals in the three contests. Collar earned all-tournament team honors. “Everyone steps up when we need them to,” Collar said. Sophomore Mackenzie Hart averages 2.6 steals a game, tied for second-best in the Sunflower League, and is also tied for second in assists. Hart assisted on five of Collar’s seven treys in her record-breaking performance. I tried pretty much every sport you can imagine as a little kid. When I tried basketball I instantly fell in love with the sport. To help my team win as many games as possible and to continue to grow as a player. Yes, I believe so. Our team has the talent and potential to go on a run this season. We are a young team so sometimes inexperience gets the better of us but we are usually right there in most games. We know we can compete and start closing out games as we get more experience under our belts. I really love the game, I have been playing since second grade, and just can’t get enough of it. I started going to the gym with my dad to shoot when I was little and just never stopped. I have played year round since probably 4th grade…playing probably 75 games a year. The atmosphere at Olathe West is great..this is just the second year the school has been open, so there is a lot of excitement for all the sports. The girls’ basketball team is getting better everyday, so the excitement just keeps building. We are a talented young group and score a lot of points as a team. My biggest strength is probably my ability to score, I’m a pretty good 3 point shooter…with deep range, and slasher to the basket. I also see the floor well, and am able to set my teammates up for easy baskets. My biggest weakness entering high school was probably my defense…but I have worked extremely hard the past year and a half to improve that….and am turning that into a strength. I feel like I am becoming a really good defender and a more complete player. Honestly, everyone has a key role on our team…all 10 players on our team contribute and each night there is someone different stepping up big for us. How competitive it is and being able to play with my teammates. Coach Williams is great. I have known her since 2nd grade and she was also my coach in 8th grade. She is smart and helps the team to continue to get better. She is always trying to push me to be the best player and leader I can be. In the summer we went to Pittsburg State’s team camp and played summer league. In the fall we had basketball conditioning. During the summer I went with my Kansas Elite team to a few showcase tournaments across the country to play against some of the best competition in the country. I have been getting some interest from a couple D1 and D2 and NAIA schools. The interest has been picking up the past month or so during my sophomore year. When I am not playing sports I like to hangout with my friends and travel. In 10 years, I will be a college graduate..although I am not sure exactly what field of work I will go into…I love sports and would love to do something in that field. My favorite subject is modern world history. I had a 3.9 GPA freshman year and a 4.0 first semester of my sophomore year. My parents because they inspire me everyday to be the best person I can be.